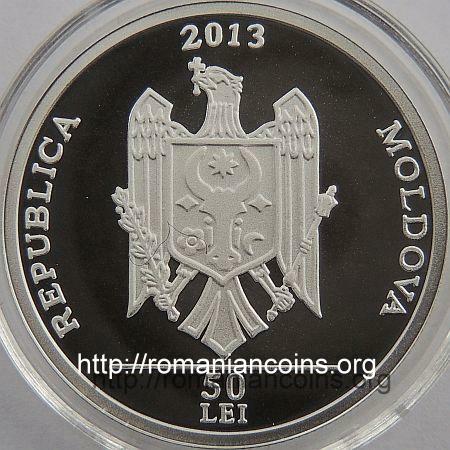 year 2013, circular inscription REPUBLICA MOLDOVA meaning "REPUBLIC OF MOLDAVIA" and the coat of arms of the Republic of Moldavia, in exergue horizontal line and denomination "50 LEI" a flock of "urători" [orators] with a plough, inscription "PLUGUŞORUL" meaning "LITTLE PLOUGH"
In 2013 the series was enriched with a silver 100 lei coin: Guguţă - literary character. To the same series belongs a nickel plated brass coin - 10 lei 2003 - Celebration of the Wine. Pluguşorul means actually "little plough", a diminutive with definite enclitic article. Pluguşorul is a very old Romanian folk custom which occurs only once a year, in the eve of Saint Basil (New Year's Eve), being a ritual of summoning the fertility of earth. The custom today involves simulating ploughing and an oration, urătură (plural urături) in Romanian, which consists on reciting a versified composition named "pluguşor” [little plough]. Flocks of youngsters (mainly), wielding little bells, whips and "buhai" are wandering from house to house and wish in oration well, rich crop and long life. 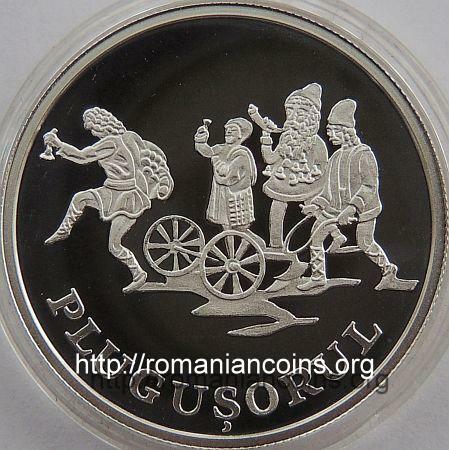 Traditional "urături" of grown-ups meant actual wandering, in flocks of up to six or more orators, through the snowed village with plough (as depicted on the coin) and live oxen. One of the orators [urători] wears - as seen on the coin - a big bag to be filled with gifts from "the orated" [cei uraţi]: walnuts, apples, "colaci" [traditional loaves of festive bread]. The orator recites while being accompanied by the sound of little bells standing for the cattle bells. When the orator is commanding "mînaţi, măi” [drive! (the oxen, cattle)] or "îndemnaţi, mă” [urge! (the oxen, cattle)], the common whips and bullwhips start to crack as if oxen would be driven to pull the plough. The "buhai" also joins in. This is a, somehow musical, instrument imitating the roar of a buhai (buhai = bull). It is made out of a little barrel having one end closed by a membrane. In the middle of the membrane a strand of hair from horse's tail is attached "which, being dampened with water and pulled successively with one hand, then with the next and so on, produces a vibration resembling the roar of a distant bull" . The next day in the morning - first day of new year's - another old Romanian, connected custom follows - Sowing or Sorcova. And listen to my word! Stop the plough you lads! Next year and many years! La anul şi la multi ani! All "pluguşoare" start with "Aho, aho", interjection which is no longer in other use in Romanian language. This interjection is most likely akin with the Middle English interjection "hoy", which later sired "ahoy". "Hoy" was used to drive cattle, as mentioned in the epic poem Piers the Ploughman of 1393 by William Langland: "And holpen to erie þis half acre with 'hoy! troly! lolly!" which roughly translates to "And helped to plow this half acre with 'hoy! troly! lolly!'". Between main sections of "urătură", the flock of orators answer the "main sayer" with long "Hăăăăăăăăăăi, hăi! ", reason for which urătură is also named hăitură. Nowadays, in the cities, it is mainly the children who "go with pluguşorul", orating especially at the relatives and neighbours and being mainly rewarded with money. Alexe Mateevici, priest, poet, soldier but also ethnographer, wrote about this custom at the Basarabian Moldavians, in "Saint Basil - New Year in the customs of Basarabian Moldavians" : "The New Year, before all, is the festivity of the Moldavian ploughman. This understanding is seen in all the customs occurring now. Because the ploughing always was and still is today the head and even only occupation of our Romanian, unmistakably the Moldavian gives it a very big signification." Also Mateevici stated the lay nature of the custom: "...the celebration of Saint Basil, the master of ploughmen, is entirely ploughman-based, peasant and not church originated. 1. Marian, Simion Florea, Sărbătorile la români. Studiu etnografic. Editura Fundaţiei Culturale Române, vol. I, Bucureşti, 1898. 2. Mateevici, A., Sfîntul Vasile - Anul Nou în obiceiurile moldovenilor basarabeni. Wikisource, December 2013.